In October 2016, the ASTRI telescope prototype, (Image 1) a novel, dual-mirror Schwarzschild-Couder telescope design proposed for the Cherenkov Telescope Array (CTA), passed its biggest test yet by demonstrating a constant point-spread function of a few arc minutes over a large field of view of 10 degrees. Three classes of telescope types are required to cover the full CTA very-high energy range (20 GeV to 300 TeV): Medium-size telescopes will cover CTA's core energy range (100 GeV to 10 TeV) while the large-size telescopes and small-size telescopes (SSTs) will extend the energy range below 100 GeV and above a few TeV, respectively. The ASTRI telescope is one of three proposed SST designs being prototyped and tested for CTA's southern hemisphere array. 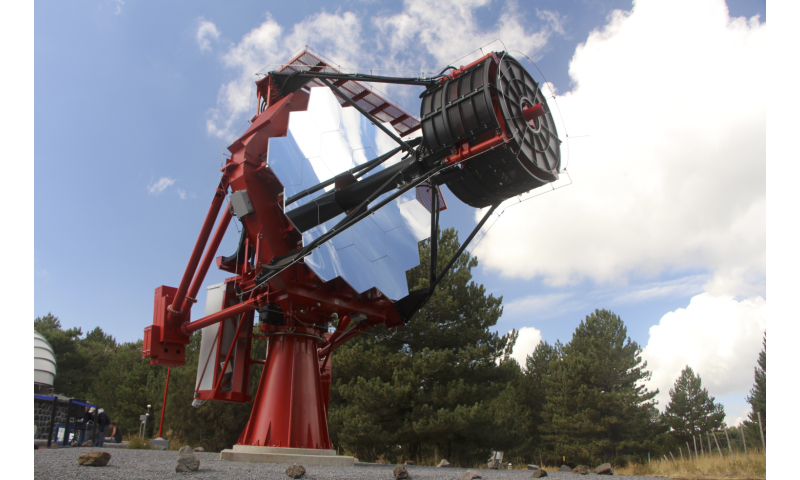 The ASTRI telescope uses an innovative dual-mirror Schwarzschild-Couder configuration with a 4.3 m diameter primary mirror and a 1.8 m monolithic secondary mirror. In 1905, the German physicist and astronomer Karl Schwarzschild proposed a design for a two-mirror telescope intended to eliminate much of the optical aberration across the field of view. This idea, elaborated in 1926 by André Couder, lay dormant for almost a century because it was considered too difficult and expensive to build. In 2007, a study by Vladimir Vassiliev and colleagues at the University of California Los Angeles (UCLA) demonstrated the design's usefulness for atmospheric Cherenkov telescopes. Image 2 shows Polaris as observed by ASTRI with different offsets from the optical axis of the telescope. 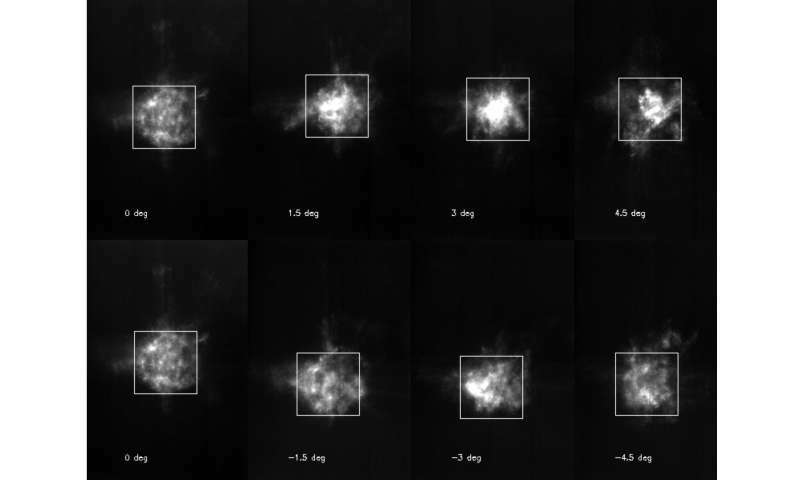 The recorded images have approximately the same angular size, each one from a different observational direction in the field of view (from 0 to 4.5 degrees from each side with respect to the central optical axis). These images show that the optical point-spread function of the telescope is approximately constant across the full field of view. This information will allow scientists to reconstruct the direction of gamma-ray photons emitted from celestial sources. "This is also the first time that a Cherenkov telescope with two focusing mirrors has been completely characterized from the opto-mechanical point of view," said Giovanni Pareschi, astronomer at the INAF-Brera Astronomical Observatory and principal investigator of the ASTRI project. "This is an important result, because it allows us to move immediately to the next step—to mount a Cherenkov camera by December 2016 and observe the first gamma-ray light with ASTRI." The ASTRI project is led by the Italian National Institute of Astrophysics (INAF) with the collaboration of a number of Italian universities, the Italian National Institute of Nuclear Physics (INFN), Universidade de São Paulo in Brazil and North-West University in South Africa. The SSTs will outnumber all the other telescopes with 70 spread out over several square kilometres in the southern hemisphere array. Since very high-energy gamma-ray showers (between a few TeV and 300 TeV) produce a large amount of Cherenkov light, it is sufficient to build telescopes with small mirrors to catch that light. The SSTs' wide coverage and large number, spread over a large area, will improve CTA's chances of detecting the highest energy gamma rays. The Schwarzschild-Couder design is being used in two additional CTA prototypes (the SST-2M GCT and the SCT), but the ASTRI is the first to conclusively demonstrate the viability of the system. Cherenkov Telescope Array prototype telescope achieves "first light"